Simple Measures is about creating a Jazz alternative to the large assortment of relaxation music available today. 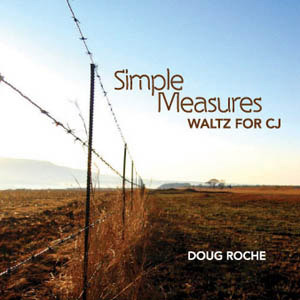 This CD is the first in a series of Simple Measures recordings. It is a mood piece ...... meant to soothe. It contains relaxing versions of some beautiful standards and one original tune performed in the Jazz Trio format. This music is perfect for any environment that requires stress-less listening, from massage therapy, to doctors' offices, to coffee shops, to any place of business, or to just watching a sunset and sipping a glass of wine. This is not another new-age recording, but experienced Jazz musicians exploring the gentler side of Waltzes, Ballads and Bossa Novas, to create a listening experience that can be enjoyed on different levels. With the expert assistance of Ron Bland on bass, and Mike Marlier on drums, this CD was recorded at Doug's home studio, live with no editing. His studio faces a private lake with the Rocky Mountains in the background.